BURLINGTON, Mass.—Desktop Metal recently added 316L stainless steel to its library of metal 3D printing materials for its Studio System™, an office-friendly metal 3D printing system that engineers and manufacturing personnel can use to print prototype and low-volume parts. A fully austenitic steel known for its corrosion resistance and excellent mechanical properties at extreme temperatures, 316L is well-suited for applications in the most demanding industrial environments, including salt water in marine applications, caustic cleaners found in food processing environments, and chemicals in pharmaceutical manufacturing. 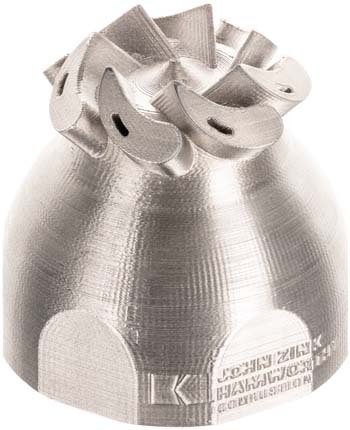 Early applications of 316L parts printed with the Studio System include a combustion fuel nozzle (UHT Atomizer) for marine tankers, a customized ring splint for medical use, and an impeller for harsh environments. The UHT Atomizer fuel nozzle, manufactured by John Zink Hamworthy Combustion, is a fuel oil atomizer for use with an atomizing medium, such as steam or air. It is typically installed in an HXG marine burner, used on steam propulsion boilers on LNG (liquefied natural gas) tankers. The objective of the atomizer is to improve low load burner performance, thus allowing the burner to run on a lower fuel oil throughput and saving operational costs when the vessel is maneuvering in port. The 316L stainless steel has been a key material for the part due to its excellent mechanical properties at high temperatures. When printed with the Studio System, the atomizer can be radically redesigned to function in a more fuel-efficient manner than those produced through traditional metalworking means. Ring splints, a common medical device, are designed to immobilize or limit the range of motion of injured limbs. Typically made of injected-molded plastic in standard sizes, ring splints often break after a relatively short lifetime. And due to traditional manufacturing methods, finger splints cannot be customized to improve fit. 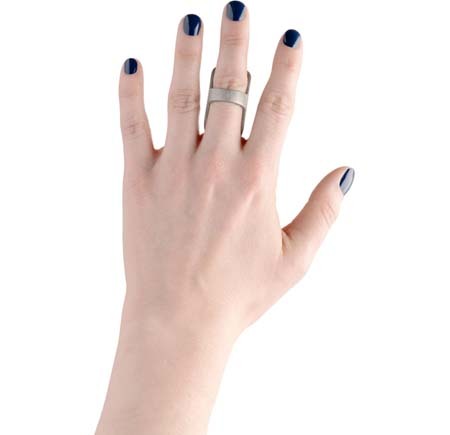 Now, by 3D printing in 316L, ring splints can be custom-printed, on-demand to the desired size, with the added benefit of an aesthetic finish and increased durability. “Being able to 3D print medical-grade steel parts like this finger splint, which is customized to the patient’s anatomy, offers many advantages as compared to previous fabrication methods that take longer and may have lower efficacy,” said Jim S. Wu, M.D., chief of musculoskeletal radiology and intervention at Beth Israel Deaconess Medical Center, and associate professor at Harvard Medical School. The materials library for Desktop Metal’s Studio System also includes 17-4 PH stainless steel. Desktop Metal said that it has more than 30 materials in development and plans to introduce additional core metals, including tool steels, superalloys, and copper, to its portfolio throughout 2019. Desktop Metal (www.desktopmetal.com) has been selected as one of the world’s 30 most promising Technology Pioneers by World Economic Forum. The company has raised a total of $438 million in financing from investors that include Ford, GV (formerly Google Ventures), GE Ventures, BMW, Lowe’s, Koch Disruptive Technologies, and Techtronic Industries (TTI).